ARAY system is unlike any other furniture system – it’s more like a crossover product – offering the perfect combination of the openness of a desking system with the storage and privacy features of a panel system. 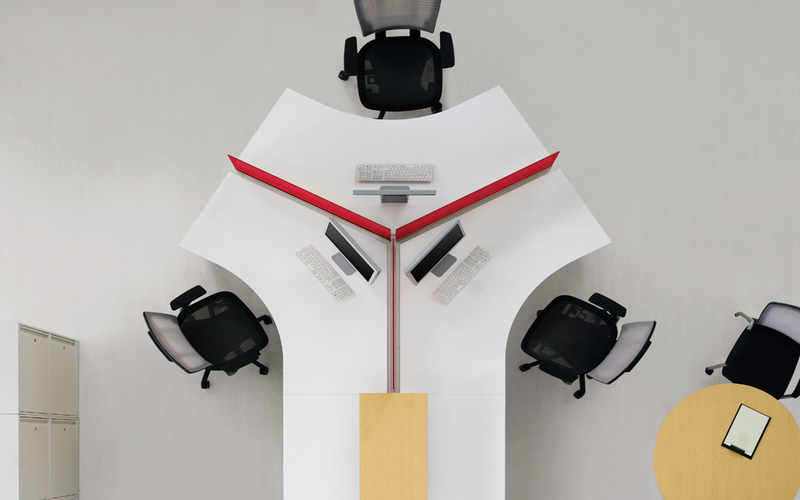 ARAY – Beam Based is a high quality Euro-style desking system that’s both flexible and versatile. Structural beams are built with heavy gauge steel for exceptional rigidity. Desktop glass screens in various colors elegantly divide space without affecting communication or light transfer. Floor privacy screens provide additional privacy and define boundaries in large open spaces. ARAY also features a full range of storage options, including fixed and mobile pedestals, glass and wood door bins and personal storage towers all available in state of the art wood grain thermofused laminates or elegant veneer finishes. ARAY cable management features a true lay-in cable design. Unlike most systems that require bundling and fishing of cables through enclosed and often sharp pathways that have been shown to cause cable damage, Aray cable runs are laid-in easily accessible pathways for problem free performance every time. For technology intensive environments, ARAY’s optional Multi-User Telecommunication Outlet Assembly (MUTOA), features a patented technology that eliminates work area outlets and cable patch cords, effectively reducing cable clutter and overall cabling cost. ARAY – Panel Based features a 3-½¨ finished frame that is constructed of 16-gauge cold-rolled steel for optimal strength and rigidity. Stackable (and de-stackable) frames can be raised or lowered to accommodate changing requirements for visual and acoustical privacy. A variety of tile options are available, including high quality fabrics, painted steel, tempered glass, slatwall, decorative laminate and real wood veneers to satisfy even the most demanding interior designers. Acoustical tiles are constructed from 20-gauge steel to be distortion free and provides a 29 STC (Sound Transmission Class) rating, one of the highest in the industry for a panel system. Tiles are also easily removable to allow access to the frame and tile system’s lay-in cable management system. ARAY’s unique off modular design allows flexibility in workspace size, configuration and in locating worksurfaces, overhead bins, and divider panels. Cable runs are laid in the beam or behind lift-off panel tiles, not bundled and fished through structural elements. ARAY – Private Office represents the next evolution in private office furniture. Based on a modular component design concept, ARAY private office version is more adaptable than conventional casegoods, allowing changes to be made easily and cost effectively. ARAY’s metal framing resists the wear and tear of the modern workplace and offers a sleeker and more modern look. Powder-coat paint finishes are scuff resistant and will not fade over time. Drawer and cabinet fronts are available in solid and 3D wood grain thermofused laminates and computer patterned real wood veneer. ©2017 Mobili Office Solutions. All Rights Reserved.